Government Funding for Foreign Direct Investment in York Region | Mentor Works Ltd.
Government funding programs can support a range of business expansion projects. When accessed regularly, these grants and loans accelerate business growth and steadily improve profitability. This approach to project financing provides business with the competitive edge needed to excel. Mentor Works is proud to partner with Invest in York to inform internationally-owned businesses about the government funding programs available to support continued growth and success. Mentor Works can also improve the application process for many of these programs through our unique Proactive Funding Approach™. Explore the following programs to gain insight into government grants and loans that could have an immediate impact on your business’ success. You may also access funding resources to deepen your understanding of the project planning and application process. Build a Government Funding Plan: Receive larger government funding contributions by matching upcoming projects to funding programs. Access this free slide deck. Amount: Up to 50% of eligible expenses or $10,000-50,000 in cost matching funds per application. Up to two applications can be submitted per government fiscal year (April 1 to March 31). Timeline: Continuous intake of applications. Apply 5-6 weeks ahead of incurring eligible project expenses. Only one project open at any one time. Eligibility: 1-250 people on payroll, $200k-50M in annual, taxed revenues, 1+ years incorporated or a limited liability partnership (LLP). Markets must be under-developed, including countries where less than $20,000 or 10% of international sales have been generated in the past 24 months. Amount: Contracts of up to $500,000 (Standard Innovations) or up to $1,000,000 (Military Innovations). Eligibility: BCIP offers Canadian innovators an opportunity to enter the marketplace that have not yet derived revenue from the related product or technology. Applicants must have an interested government party to write into their proposal. Amount: Minimum funding contribution of $10 million per project. Type of financial support awarded is at the discretion of the program; this can consist of a combination of repayable financial support and/or financial reimbursements up to 50% of project costs. Timeline: Open. Streams 1-3 on continuous intake and stream 4 on annual intake dates. Successfully funded projects may take up to five years to complete. Eligibility: Incorporated Canadian businesses with high growth potential and the ability to drive innovation. Amount: Up to $10M non-repayable grant with 80% of direct labour and 50% of sub-contractor expenses. Timeline: Federal funding released April 1 each year. Projects can take place from April 1 to March 31 of the following year. If you apply mid-cycle, your project must be completed by March 31st. Eligibility: 1-500 people on payroll, 2 years incorporated with internal technical R&D expertise. Amount: Up to $25,000 from NSERC. No cash required from company, however company in-kind contributions are expected. Timeline: Rolling applications, no deadlines, 4-6 week turnaround on approvals. Amount: 25-50% of project expenses to a maximum $200,000. Amount: 33% contribution. SDTC will pay one funding milestone in advance. Eligibility: Focused on clean air, water, climate change, and other environmental projects. Projects should support productivity improvements and Canadian industry competitiveness. Amount: Funding amount is a percentage of project costs, dependent upon type of project, to a maximum of 100% of costs or a maximum of $1,000,000. Applicant’s portion of the funding must be substantiated as cash, in-kind or committed funding. Eligibility: Eligible projects are those that develop or pilot innovative conservation programs, practices and technologies. Eligible costs are those related to the design, development, demonstration, installation, implementation, testing, measurement and performance verification of the project. Project must be completed within four years. Amount: The funding contribution of up to 75% of the eligible expenses up to a maximum payable of $75,000. Timeline: The program is open and accepting applications. Eligibility: Dedicated to innovation, science and technology-based companies; you must have less than $50 million in annual sales and less than 500 employees. Amount: Up to 50% to a maximum of $600,000. Timeline: Each partner country has its own application deadline. Eligibility: For profit, <500 employees, and creating technologies with an international R&D partner for healthcare, cleantech, water tech, ICT, and manufacturing technologies. Amount: Up to 15% of eligible expenses to a maximum $1.5 million in non-repayable grant funding for projects with budgets up to $10 million. Projects with budgets that exceed this amount may be eligible to receive a combination of grants and loans of up to $5 million. Eligibility: Applicants must have been established for at least 3 years, have 10 or more full-time employees, and be located in Southwestern Ontario. Projects must be completed within a 2-4 year timeline and create at least 10-15 new full-time positions depending upon project size and company size. Amount: Non-repayable grant contributions of 50-83% of training costs (ie. course, exams, textbooks, software resources, etc.) up to a max limit of $10k-$15k per trainee. Timeline: Training projects must be completed within the year and cannot be over 12 months in length. Eligibility: Ontario-based SME w/ $2M liability insurance. Trainee must be a resident of Ontario, permanent Canadian citizen, or granted refugee status. Supports the hiring of recent post-secondary graduates who are unemployed or underemployed given their level of completed education. Internships should be focused on providing in-demand skills that will help the youth worker gain experience. Upon successful completion of internships, employers may offer an offer for permanent employment. Amount: Varies by hiring program; most 12-month internships provide up to 50% coverage to a maximum $14,000-$20,000. Timeline: Internships must be 3 or 4+ months. Funding available on a first-come first-served basis; apply when the programs open (generally Q2). Eligibility: Graduate must have a post-secondary diploma, be between 15- 30 years old, Canadian citizen/resident, out of school, and work minimum of 30 hours per week. Amount: Matching funds to cover salary expenses up to $7,500 over a 4-month period. Timeline: Open. 50% over the grad student’s time will be spent at the company, other 50% at the educational institution. Offers industry partners an opportunity to host a post-secondary or post-graduate researcher. The purpose of the fund is to offer industry partners highly skilled researchers to apply their knowledge and tools gained through school. Interns and fellows hired through the program are expected to remain part of the business past the paid period. Internship Component: Up to $10,000 in grant funding towards post-secondary student or graduate internship for four months at 50% coverage. Company contributes 25% cash and 25% in-kind. Up to 6 candidates per application. Fellowship Component: Up to $35,000 ($32,500 cash + $2,500 in-value for professional development) towards a PhD graduate or post-doctoral fellows for 12 months. Company contributes $25,000 cash plus $25,000 in-kind . Up to 2 candidates per application. Timeline: Applications are accepted at any time, but capacity for program streams and varies throughout the year. Review typically takes 6 weeks. Eligibility: Interns must be a senior undergraduate student, graduate student, or recent graduate (within three years of graduation). Fellows must hold a PhD in any discipline completed within the last five years. Industry partners must be for-profit within Ontario (not-for-profit will be considered on a case-by-case basis). Internships and fellowships must be project-based. The programs listed above are just a small collection of the Canadian government grants and loans that could positively impact your business. Knowing what programs are available is the start of the funding process; the secret is being able to effectively plan to use government funding for projects. By applying the Proactive Funding Approach™, business owners and executives can ensure they maximize the amount of funding received for upcoming projects. This 3-part system shows how to plan and incorporate funding for a greater number of projects, effectively expanding cash flow and supporting a greater number of initiatives. 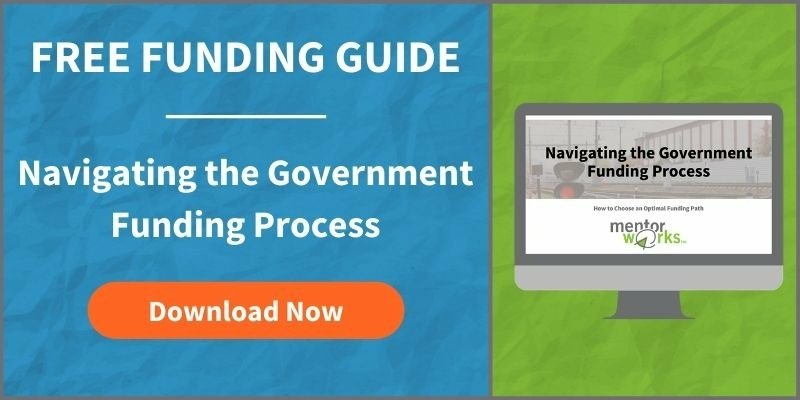 Download the Build a Government Funding Plan slide deck to learn more.